Foxhall further cited "a survey by the Texas Criminal Justice Coalition, in partnership with the American Federation of State, County and Municipal Employees," which said the employee grievace process is ineffective. "About three-fourths of those surveyed said they did not find the process to be 'fair and effective'," and Duane Stuart of The Backgate website told her "that staff are hesitant to report any corruption or wrongdoing to TDCJ." (Through Grits' own various back channels and informants, I hear the same thing all the time.) Many of the new security measures aimed at reducing the flow of contraband have fallen most heavily on TDCJ employees, contributing to poor morale, and those aren't going away. The only lawmaker quoted in the story was Sen. Whitmire, who "agreed that many prisons were built in the wrong places and for the wrong reasons." But his suggested solution doesn't inspire confidence. "Now, he said, legislators need to focus on getting Texans to pay for improvement of conditions for the workers." However, the 2013 session almost assuredly won't result in higher pay for correctional officers (COs) because of the budget crunch, and in fact Grits expects some lawmakers to seek to cut their benefits and/or further reduce their number. 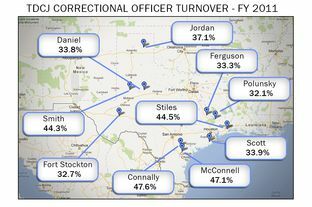 There are more COs at TDCJ than any other category of state employee and even a small pay hike would have big budget implications. And unless they're ordered to provide air conditioning by the federal courts, that problem isn't going away, either. For a variety of reasons - mostly related to failures of budgetary leadership by the last legislature - the 83rd Texas legislative session's budget debates will be dominated by how to pay for education and healthcare, with the prison and probation systems scrapping for crumbs. With all due respect to Sen. Whitmire, anybody who claims the Legislature will "pay for improvement of conditions" for prison workers is blowing smoke. One might as well suggest the problem will be resolved through prayer for divine intervention, the way Gov. Perry two years ago called for Texans to pray for rain instead of championing a viable water plan. Scott Henson, a former reporter who writes the criminal justice blog Grits for Breakfast, said increased spending on prisons is unlikely. “We’re at the complete end of that cycle that was begun 22 years ago. No one wants to foot the bill for how expensive it is,” Henson said. Most agree that the temporary closures in Kenedy due to staffing shortages are not something to be celebrated, but Henson said that the state should continue efforts to reduce the prison population and close prisons in an intentional manner. Even after the state closed its first prison last year, Henson said, Texas is operating more prisons than it should be. Texas Justice Dot Org has run a "snitch" message board for TDCJ's correctional officers since 2004. It is hated so much by the TDCJ administration, that every effort is made to identify employees who post. Those who ignorantly leave behind their email (which is discouraged for obvious reasons) have been met with warnings from their wardens. In fact, one warden recruited one of his security lieutenants to monitor the board when it was suspected some of his employees were posting negative things about the unit. Only recently at the Backgate website, the owner/moderator was denied a promotion because of his message board. Of course, the administration is attempting to cover it up and now, an employment attorney has been retained for possible legal action against the agency. Several legitimate complaints have been posted on TJDO's message board. One noteworthy positive from the board, has been an awareness of situations in which the agency has acted upon. So, we will continue to host the board to bring awareness to problems in TDCJ. I don't see how anyone can seriously argue with the facts stated in this post. It's a no-brainer that the lege is not going to drops millions more dollars on prison security and healthcare as long as the education ox is being gored and many other interest groups will be having pleading hands extended as well. The easiest and quickest fix in my opinion is to release more and more nonviolet felons by letting them either "go flat" (ending their obligation to the state) or enroll them in community supervison, where the felons themselves pay all or most of the cost of their probation. There needs to be serious sentencing reform too, so these nonviolent guys could just do 90 to 180 days in the county lockup in instead of being sentenced to several years at the state's expense for simple possession, evading arrest, lying to a police officer, felon in possession of a firearm, assault on a policeman, plus a whole myriad of other "charge enhancements" that have arisen out of the ill-starred "law and order", "tuff on crime" era. "Many of the new security measures aimed at reducing the flow of contraband have fallen most heavily on TDCJ employees..."
How do you (meaning the public) think all the contraband gets in? How else can cellphones get on Death Row (where contact visits are NOT allowed !)? I don't disagree with that, Dewey, but that doesn't mean it's not more intrusive for staff. There are reasons for all these factors, but that doesn't mean they don't contribute to high turnover rates. TDCJ makes COs give up their Facebook passwords: Would you put up with such an invasive employer for $30K per year if you had any other options? Hey Grits, do you see the TDCJ utilizing the hundreds of thousands of returning vets to plug up these holes? Militarizing the penal system all in the name of... wait, they already did that. Why else would they have Captains and LTs vs. supervisors and guards. Thanks. What can be done about this? Short of a second coming, I hold out no hope of a workable solution in the short term. Putting money in the prison system is not popular with the public. That is the biggest reason the Legislature is so inert. Voting to fund the prison system is not a career builder if you what to stay in Texas politics. So yeah, they will focus on education and Medicaid and when the session goes in the history books virtually nothing will be done about the under funding of the prison system. What’s ironic is that in the end the funding be available when the Federal Judges mandate the state to correct the problems.